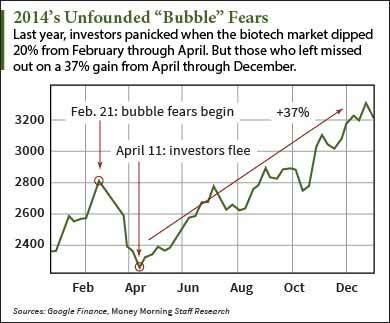 Investors are again worried about a biotech bubble as biotech stocks take another big hit this week. Since April 23, the Nasdaq Biotechnology Index has dropped 6.8%. During the same time, the S&P Biotechnology Industry Index is down 8.5%. Some of the most popular biotech stocks are feeling the brunt of it. Gilead Sciences Inc. (Nasdaq: GILD) has dipped 2.2% this week. Amgen Inc. (Nasdaq: AMGN) is down 6%. Biogen Inc. (Nasdaq: BIIB) has fallen more than 10%. Money Morning's Biotech Investing Specialist Ernie Tremblay said on March 27 that this is normal behavior for biotech stocks. "The sell-off we're seeing now seems to happen every year at about this time, like clockwork," Tremblay said. "There are always things going on in the news that seem to explain the drop, but the meta-picture is simply this: the market breathes in, and the market breathes out." In fact, we haven't even reached correction territory yet. A stock market correction is defined as a 10% dip in the market. So we still have some room to go down before we even reach a correction. And a correction should not be mistaken for a bubble. A bubble is a cataclysmic crash in the market. Tremblay says the market is just stabilizing after an impressive run. From Jan. 1 through April 23, the Nasdaq Biotechnology Index climbed more than 21%. That far outpaced the Dow Jones, which gained just 1.3%. "Investors, even institutional investors, are aware of this market movement," Tremblay said. "So as the biotech sector races upward, everyone begins to wonder how long the momentum can last. After a while, they get queasy from the altitude, and their risk tolerance erodes. Time to take profits. So share prices begin to tumble." We saw a very similar situation in 2014. Between February and April, the biotech market dipped roughly 20%. Of course, that was much worse than what we've seen now. At the time, nervous investors panicked and fled the market. But between April and December, the market rebounded and gained 37%. Investors who left in a panic missed the lion's share of those gains. Wedbush Securities' Head of Equities Trading Ian Winer reiterated Tremblay's point to The Wall Street Journal this week saying this was "a normal drawdown" for biotech stocks. "(Biotech) has been trading on an incredible multiple and everybody owns it," Winer told The Journal. Biotech stocks are back as we head to the new hear. The correction was overdone due to panic and not dd.